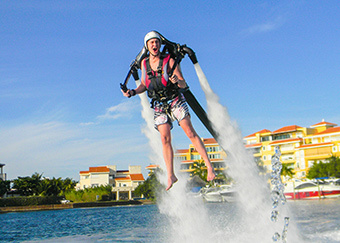 JetPack Fly like a superhero! Transportation from / to your hotel is NOT included. You can take the public bus to Plaza La Isla Shopping Center at KM 12.5 in the Hotel Zone. Go to Marina Lighthouse to check in. Bring: Swimsuit, towel, t-shirt or jacket. We offer wetsuits & water shoes to rent or you can bring your own.